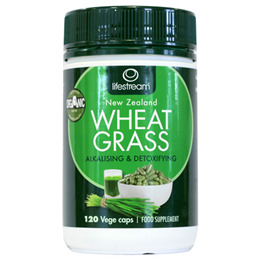 Lifestream Wheat Grass is NZ grown, 100% certified organic and contains only the Wheat Grass plant. We do not use any bulking agents like corn syrup solids, rice flour or genetically engineered maltodextrin. Lifestream Wheat Grass is free of pesticides, chemicals, preservatives, additives and fillers. 100% Pure organic Wheat Grass powder, Vegetarian capsules (cellulose & water). Adults: 4 capsules daily with food. Children age 5 – 15 yrs: 2 capsules daily with food. Take with water or fruit juice. Below are reviews of Lifestream Wheat Grass Powder - 120 Vegicaps - Best before date is 31st May 2019 by bodykind customers. If you have tried this product we'd love to hear what you think so please leave a review. Question about Lifestream Wheat Grass Powder - 120 Vegicaps - Best before date is 31st May 2019 If I take a wheat grass supplement does this mean that I do not need to take any other additional vitamins / minerals along with this? Green foods such as Wheat Grass are among the richest natural food sources of minerals, enzymes, B group vitamins, antioxidants and chlorophyll.